Open a window to a seaside paradise in the comfort of your own home. No matter the time of year, the warm summer is never far. Lined with a sea of glimmering fire glass, this fireplace sculpture is sure to have your friends talking. The sculpture sits directly on the existing fireplace grate, replacing your standard ceramic logs. 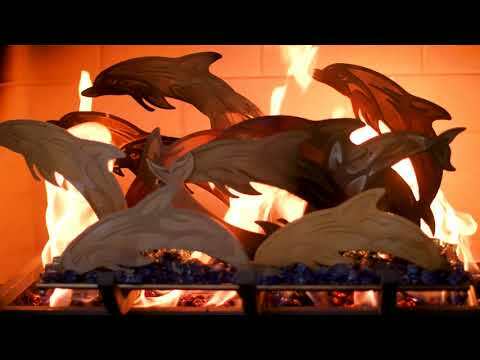 Each fireplace sculpture is handcrafted with a variety of 304 grade stainless steel dolphins on an 8mm stainless steel grid base. Due to the handmade nature of this product, each one is unique and will have slight variations. Includes 3 pounds of fire glass. For use in vented fireplaces only. Alpine Flame warrants stainless steel sculptures to be free from defects in materials and workmanship for a period of ten (10) years from date of purchase by the original purchaser. Alpine Flame warrants their H-burner to be free from defects in materials and workmanship for ten years from the date of purchase.